Pablo Hernandez put Leeds United back on top of the Sky Bet Championship for a few hours at least as he scored a rare winning goal for the Whites at Bramall Lane. Leeds had not won away to Sheffield United since they won the first division title back in 1992 so the significance will not be lost on their 1-0 success in a feisty game poorly officiated by Oliver Langford. A tight match could have gone either way and the only goal had more than an element of luck about it as it came from a bad back pass made worse by home keeper Dean Henderson as he kicked the ball straight to Jack Clarke, who smartly crossed it for Hernandez to tap into the unguarded net for his fourth goal in five games. But it may have been an easier game for the Whites if referee Langford had shown any consistency in his decisions when he could have sent three Blades players off. David McGoldrick got away with an over the top of the ball challenge on Mateusz Klich; Enda Stevens was booked then got away with a second offence; and George Baldock should have been carded in the first half for a kick on the shin and came up with a professional foul after the break. He was booked on this occasion, but would have had to walk had the official not been so king earlier. 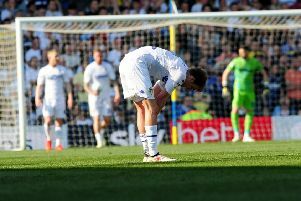 With the challenges flying in at times it was a surprise Leeds only lost one player to injury, but it could be a big one as skipper Liam Cooper hobbled off with a knee problem that threatens to keep him out for a spell. As for the football action, McGoldrick forced a good save from Bailey Peacock-Farrell with a well struck shot from 25 yards out and several crosses caused the visitors’ keeper problems as he tried to punch clear. Leeds sub Aapo Halme had the first chance for Leeds as his shot in a crowded box was well saved low down by Henderson. Hernandez saw a free-kick blocked while McGoldrick continued to be the hosts’ most dangerous player as he cut in from the left only to send his curling shot wide. The Blades did create a good chance near the end of the first half as Billy Sharp took got on the end of a McGoldrick cross, but sent the ball wide. He was offside, though no flag came. The game opened up a little early in the second half with Barry Douglas sending a shot over from range and second sub Clarke seeing a shot saved low down by Henderson. Klich made space cleverly in the box, but his low shot was saved by Henderson. At the other end McGoldrick had a clear opportunity, but with only Peacock-Farrell to beat the Whites keeper saved well with his legs. Stevens sent a 25-yarder not far over, but Leeds came within a whisker of a goal as Kemar Roofe’s powerful header from a Stuart Dallas cross was inches wide. Klich also went close with a 25-yard shot. The goal finally came on 82 minutes when John Egan’s back pass led to the chain of events that saw Hernandez net his seventh of the season. Hernandez almost added another soon after with a 20-yard shot that was saved low down. But Sheffield put in a big finish and were unlucky in added time as Conor Washington’s overhead kick hit the crossbar. Head coach Marcelo Bielsa would have been happy to have drawn the game. He said: “It was very tactical game. If the opponents had drawn the game I could have said it would be a fair result. “I made a change in the middle of the first half because Pablo Quiroga told me to do it. We switched positions between Pablo Hernandez and Kemar Roofe and this improved a lot our game. “At the end of the day the mistake made by the opponent and when they hit the post that decided the game. Sheffield United: Henderson, Basham, Egan, O’Connell, Baldock, Norwood, Fleck, Stevens (Johnson 84), Duffy (Washington 62), McGoldrick, Sharp. Leeds: Peacock-Farrell, Jansson, Phillips, Cooper (Halme 21), Dallas, Forshaw, Douglas, Klich, Hernandez (Shackleton 90), Alioski (Clarke 45), Roofe.